A little while ago, someone tweeted his awe of the fact that over 600 million people are connected to each other on the one platform, ie Facebook. This got me thinking, are all these people really “connected”…? I’m sure you’re familiar with the Six Degrees of Separation principle. It holds that on average, anyone is only 6 personal relationships away from anyone else. Whether Facebook adds anything to the equation is questionable. Madonna has a Facebook page – well, I think it’s her. There’s a problem already. For the sake of this argument, let’s accept it’s her. I can write a message on her wall and hope she replies, but that’s not really the point. I could also mail her a letter or press the buzzer at her Hollywood mansion. The point is connectedness. For the theory to hold up, I must be only 6 Facebook users away from the Material Girl, and thereby be able to engineer a personal introduction. Maybe in theory I can, but while I know who I’m connected to, I don’t really know who they’re connected to, let alone who they are connected to. And that’s only a few degrees in. Sure, I could ask “Does anyone know anyone who knows anyone who knows anyone who knows anyone who knows Madonna?”, but that would be a tad silly. No one could possibly know. Again in theory, my message would reach someone who could indeed arrange an introduction, but the probability of that happening is ridiculously low. Human nature dictates that a rapidly diminishing number of people will pass it on, let alone to the extent required to get a hit. So while 600 million people are technologically connected on Facebook, practically they aren’t because everyone’s effective network only stretches so far. The best we can do is stretch it as far as possible. Much has been said of the “circles” feature in Google+, and rightly so. I really like the idea of targeting my messages to just friends, or just family, or just whomever. It makes sense. 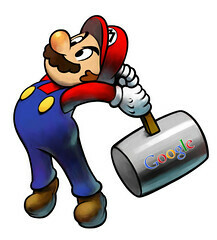 It’s Google’s trump card against the likes of Facebook and Twitter. The achilles heel of Facebook is that its friending system is binary: either you are my friend or you are not. If you are, I’ll be sharing my family reunion updates with you, and conversely I’ll be sharing my experience of burning a police car during the Canucks riot with my mum. Few of us are aware you can “customize” whom you share your updates with, but selecting individuals one by one is hardly user friendly – especially if you want to update 67 people. Indeed, Facebook has a “friends list” feature which allows you to filter your incoming news feed. You’d think it would allow you to filter your outgoing news feed too. Granted, I’m no Facebook expert, so maybe this can be done. But that’s the point: so much about Facebook is onerous and secretive. I’ve got better things to do. Then there’s Twitter. Some commentators have heralded the death of the popular microblog at the hands of Google+ because, unlike its alleged nemesis, its messages are restricted to 140 characters. I couldn’t disagree more. The 140 character limit is Twitter’s saving grace, and ultimately its competitive edge. Fellow tweeps, I love you all – but in very small doses. If I want more, I’ll read your blog. As for targeting messages, Twitter can’t do that. However, it’s easy enough to manage multiple accounts with a client such as HootSuite. Forget Facebook, forget Twitter. 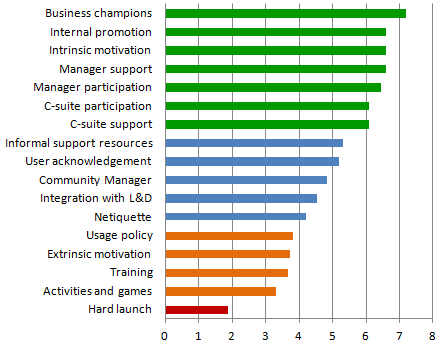 The one who has the most to fear from Google+ is Yammer. To me, Yammer is the most similar to Google+. In particular, its “groups” feature allows you to direct your messages to a particular bunch of people. You can also assign people to groups – even if you’re not the group’s admin. All good for Yammer, right? Wrong. You see, everyone on the planet has heard of Google, but relatively few have heard of Yammer. And guess who’s shifting their attention to the business sector. Since I wrote my article last week about critical theory, I have been more attuned to the messages being propagated by my peers. For example, some of them have been blogging and tweeting about the role of social media in driving the pro-democracy protests in Egypt. I see I’m not alone (here and here) in being a little less inclined. The truth, I suspect, is that the protests in Egypt have been catalysed by the amassing of the population for prayer. Bloggers and the Twitterati are self-evident social media fans, so it’s to be expected that some of them will adopt an evangelical view of the role of Web 2.0 in world affairs. Don’t get me wrong; I’m not trying to underplay the role of social media in connecting people with each other and with the outside world. It certainly played its part in Tunisia and Iran, for example. Besides, if it wasn’t useful, oppressive governments wouldn’t try to shut it down. No, my point is that while social media is a significant component of the Egyptian pro-democracy movement, it is one among equally or even more significant components. 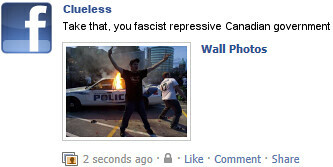 Put it this way: the protests would still have happened if the Internet did not exist. The fact that it does exist means the people have a universal communications tool at their disposal. Drawing all this down to the less heady world of e-learning, I can certainly see a parallel. It’s important to recognise the role of social media in facilitating social learning in the workplace. However it’s not a panacea. Relying on truisms such as “all learning is social” and on altruistic notions such as “collaborative learning” is a cop out. 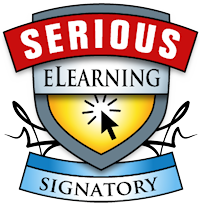 Your learning architecture needs to include much more, such as on-demand self-paced learning resources (eg wikis, simulations, e-books) and – dare I say it – formal training (eg virtual classes, online courses, assessments). My point here is that while social media is a significant component of the corporate learning model, it is one among equally or even more significant components. 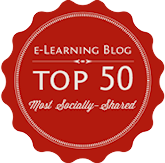 Put it this way: learning would still happen in the workplace if social media did not exist. The fact that it does exist means we have an effective learning environment we can leverage. Today I read about the Twitter misadventure at H&R Block whereby a call centre employee assuming the name “Kid Fury” urged all his followers to phone in and ask for him. It was his final day of work with that employer, so he thought it a harmless last hurrah. That was until it went viral and H&R Block call centres across the country were jammed with fools asking for Kid Fury. The incident is kinda funny, kinda shocking, kinda scary. So what can it teach us? Yes, the kid’s stunt was probably an innocent bit of fun, but I wonder if he would have done it had he loved the company? Why was he leaving anyway? I’m not 100% convinced that a formal Social Media Policy is necessary – especially if your Employee Code of Conduct is up to scratch – but in any case, you need to document what your employees can and can’t do on social media. And you need to ensure they know it. In this age of Web 2.0, if you don’t scan Twitter, Facebook, YouTube, Foursquare and other forums for mentions of your brand, you don’t know what your customers (and prospective customers, and employees, and ex-employees) are saying about you. That means you can’t respond. Most cases of negative social media that I am aware of were (or would have been) best dealt with through participating in the conversation. In the case of Kid Fury where the antagonist was an employee, the employer still had to be very careful. I don’t suggest letting anyone off scot free, but how would it look if a multi-national corporation sued a likable young fellow? So thank you Kid Fury for teaching us those lessons – whether you meant to or not! Earlier this week, I attended a Twitter Camp billed Twitter is not for dummies. I had the privilege of facilitating one of the breakout sessions, which focused on the business applications of Twitter. We discussed a range of issues around this topic, and we generated some really bright ideas that I feel are worth pursuing in the corporate sector. 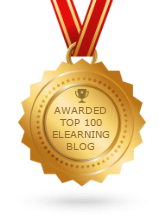 Some of the ideas specifically relate to e-learning, while others may fall more comfortably into other portfolios. By “external”, I mean your company playing in the real world, beyond its office walls. With upwards of 20 million Twitter users around the world, companies should at the very least be scanning this massive public forum to keep tabs on what people are saying about them. I see this kind of activity falling into the Public Affairs portfolio, as it concerns brand management. They need to know if someone is bad mouthing the brand across the Twittersphere, and respond accordingly. But of course, tweet scanning also falls into the Customer Service portfolio. Twitter is used by many as a loudspeaker to vent their displeasure at bad service. Organisations shouldn’t be scared by this; in fact, it presents you with an opportunity: Why not respond to the customer, remedy their issue and turn their loyalty back around? I can tell you that CommSec actually did this for me recently, so it sure does work. According to Susan Hall, Dell takes tweet scanning one step further: They don’t just look for mentions of Dell, they also look for mentions of their competitors. What an opportunity to win new customers! Tweet scanning is one thing, but active tweeting is something else again. Perhaps your company should be sharing news and conveying other key messages to the Twittersphere. NEC is very active in this space, as is Southwest Airlines in the US: Imagine a raging storm shuts down Dallas airport and all flights are diverted to New Orleans; the Southwest call centre is jammed with thousands of panicked callers. Suddenly Twitter comes into its own as an alternative communications medium. What could your company tweet about? • Its latest financial results. • The release of a new product. • The latest warm & fuzzy activity undertaken by its staff for the community. But you have to be very careful to provide value. If you keep your tweets company-centric, then you won’t be very interesting and no one will want to follow you. The trick is to keep your tweets customer-centric instead. In fact, according to Spike Jones, you probably shouldn’t even mention the company name at all. • Are you paying too much tax? Make sure you submit your Tax File Number to your financial institution. 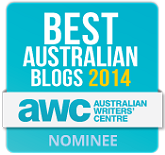 • Did you know that the average Australian is woefully under insured? Ask your financial planner if you are adequately covered. Saving money? Suddenly I’m interested. OK, so you could send messages out to the Twittersphere, so why wouldn’t you also invite them in? Well guess what, ANZ and Telstra are doing just that. These companies invite their customers (or prospective customers) to ask questions, submit complaints, provide compliments (Heaven forbid! ), and most importantly, they have staff at the ready to respond quickly. So maybe Twitter provides your business with an opportunity to engage with a different demographic of customer. I don’t know about you, but I don’t like robots answering my calls and putting me on hold forever, only to be transferred upteen times. But send a tweet? Yep, I can do that. The CEO of Zappos, Tony Hsieh, actively encourages his staff to follow him on Twitter. He tweets jokes, inspirational quotes, humorous anecdotes, that kind of thing. But what if your organisation wanted to tweet behind closed doors, out of sight of the prying public? Well, you can do that with Yammer – a Twitter-like platform that allows you to set up a “group” comprising your employees only. Imagine interacting with your colleagues across the enterprise, asking questions, collaborating, sharing knowledge. Why spend half an hour running around trying to find someone who can help you, when you can just post it to Yammer and let the crowd post a reply. This is a classic example of informal learning, and it’s central to the evolution and modernisation of workplace training. By “personal”, I mean you using Twitter for your own professional purposes. For example, I use Twitter as an international community of practice. 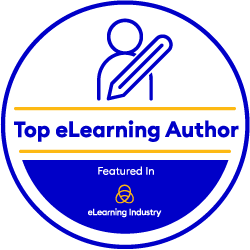 I’m connected to a circle of e‑learning professionals from all over the world; I’ve chosen to follow their tweets, and some of them have chosen to follow mine. I share my knowledge, and I learn a lot more in return. So as a technology, Twitter is really simple. It’s what you do with it that makes it powerful. In my previous article, I explored one of the principles to emerge from the recent AMPLIFY09 festival, namely “Everything big started small”. 2. Kate Albright-Hanna, the Director of Video for the 2008 Obama presidential campaign. Social networking has been around since the dawn of time. However, the exponential growth of online platforms such as Facebook and Twitter has taken it to a whole new stratosphere. Facebook has more than 200 million active users, equivalent to being the 5th largest country in the world. More than 100 million users log on to Facebook at least daily. The average Facebook user has 120 friends on the site. But what do these numbers mean? They mean millions of people are connected to millions of other people via Web 2.0 technology. It’s up to the corporate sector to either ignore this phenomenon, or harness it. A wonderful example of the latter was provided by Spike in his session Look who’s talking! What if your customers advertised for you? Only a few years ago, Fiskars, the manufacturer of those orange-handled scissors, was experiencing low brand loyalty. Online mentions of the brand by name was almost zero. After all, they make scissors. 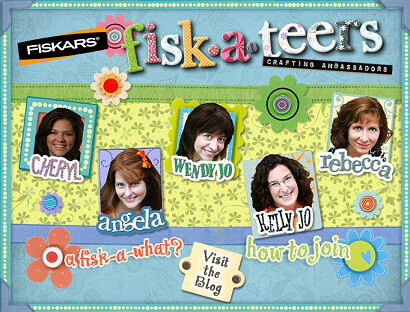 Fast forward to today, and Fisk-A-Teers has taken the US scrapbooking community by storm. Over 5000 enthusiastic members chat online, comment on the blog, post messages, upload photos, and keep track of their calendar of events. Why is Fisk-A-Teers so successful? Simple: it’s a social network for people who are interested in scrapbooking and crafts. The members aren’t obliged to promote the Fiskars brand or its products. Instead, they are encouraged to talk about their hobby, their passion, their work. So it’s not about “selling”. It’s about building identity, igniting a movement, and generating goodwill. Technology doesn’t drive this philosophy, but it enables it to flourish. The priceless brand exposure and word‑of‑mouth marketing follows naturally. Kate described a similar approach in her session How was new media a game-changer in the 2008 US elections? The Obama campaign was unique among its predecessors in its heavy use of online video via YouTube. Like Brains on Fire, Kate and her colleagues focused on igniting a movement. Most of the video produced by the team depicted everyday Americans rather than Obama himself. Obama’s message is clear: it’s not about me, it’s about us. Again, technology doesn’t drive this philosophy, but it enables it to flourish. The Obama campaigners weren’t merely courting voters, they were empowering communities. In terms of e-learning, the principle of “Social networking is king” has implications for pedagogy. Whether a company sanctions it or not, employees are going to use tools like YouTube, Facebook and Twitter – whether inside or outside of work hours. Instead of resisting or ignoring it, why not integrate social networking into your blended learning model? I’d suggest it could support informal and JIT learning, not to mention increasing engagement. Imagine your colleagues sharing ideas, helping each other out, making each other aware of useful resources, asking questions, exploring, contributing, discussing. Shift learning in the workplace from a chore to a joy.